Clam Chowder comes in many shapes and forms, the most common ones being Manhattan clam chowder (made with tomatoes) and the so-called New England clam chowder (with milk and cream used as a base). 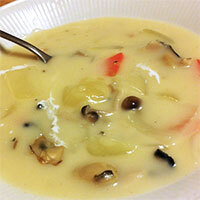 If you are thinking about losing weight, the one you should avoid is New England clam chowder. Most of the seafood is rich in heart-healthy fats, and clams are no exception; they have more protein than chicken and have more iron than beef, that's what makes Clam Chowder such a good choice for a healthy diet. The calories in Clam Chowder per 348.5g(1 plate) is 369 calories. Clam Chowder is calculated to be 106Cal per 100 grams making 80Cal equivalent to 75.47g with 32.03g of mostly carbohydrates、21.75g of fat、10.7g of protein in 348.5g while being rich in vitamins and minerals such as Vitamin B12 and Selenium.